When you choose to engage in sports, you must be ready to pay some substantial money on your sports shoes which is very important for a player to avoid injuries to their feet while playing. When it comes to the selection of a brand then Nike is the best that has won million of hearts around the world. Nike is an American company that provides the world, with the best shoes and other accessories. Nike shoes may provide you with perfect flexibility; it comes with solid rubber and herring bone which provides support for the player. Nike footwear are light weighted and durable in itself. 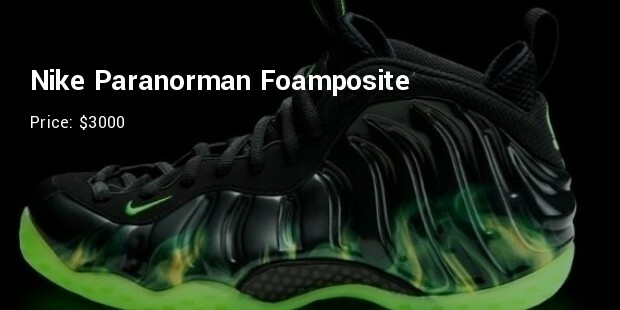 Following are the most expensive Nike shoes which you would definitely want to purchase. 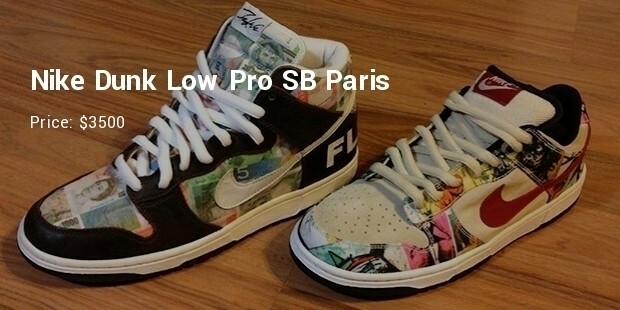 This Nike SB flom dunk high stands first in our list of being the most expensive sneaker in the world. The flom (for love of money) dunk high was made in a lope of 24 pair; these sneakers are available in white and black basics with red and gold accents that mark the stylishness. This limited stock sneaker was sold only through auctions since 2011. It has really tall tops and will be modified, in the recent time, to have light in its heels and laces that could automatically tighten itself. If you want to shine as a fashion pioneer then it is a real good choice for you. This Rick Ovens Geobasket is available in brown iguana skin and is completely partial version owing to their striking raw materials. Some privileged celebrities like Madonna, Nicole Richie, and Rihanna sported this type of shoes. This sneaker is textured with lines and is wonderfully contrasted with white skin back, to add charm and stylishness to it. 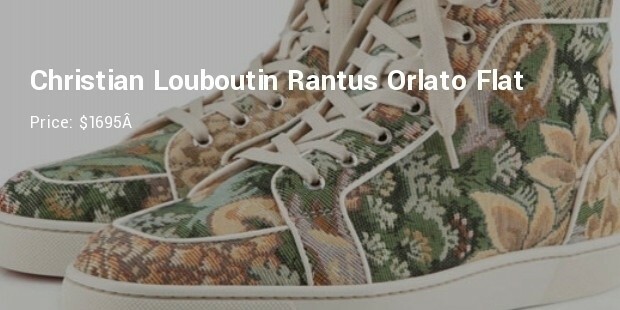 French painter Bernard Buffet is the man behind the artwork of this beautifully patterned shoe. 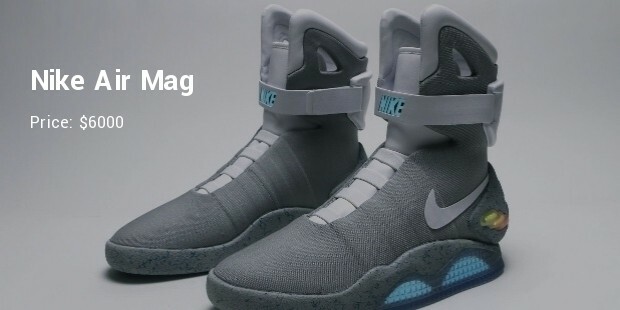 Only 202 pairs of this shoe were created. It is one of the unique shoes in the world. Besides being a piece of footwear it is also a piece of art. If you want to go to any party and want to sport that funky look then this sneaker is the best option to wear on. Nike is undoubtedly the brand for the shoes which everybody in the world knows of. 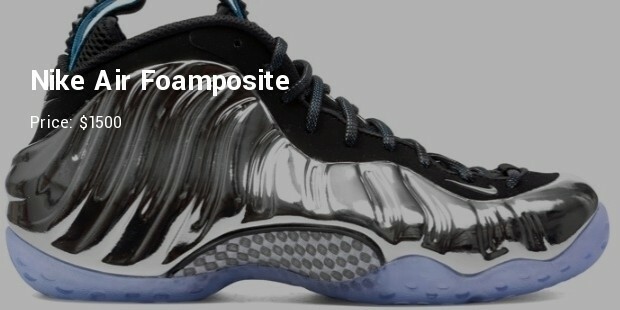 It is definitely the first pick for anybody who has a fetish for sport shoes. Though the cost really high but they are the most comfortable gift you can give to your feet while playing.